Though my preference is almost always for what might best be termed fine art practices, when it comes to Paul Graham’s work it’s generally been his documentary work that has interested me most and, though his work looks great in galleries, books like Beyond Caring and Troubled Land have moved me more. It’s not that I don’t like Graham’s later work – certainly I found a lot to like in his 2011 Whitechapel Gallery exhibition – it’s just that the books he produced in the 1980s seem exceptional. With this in mind, I approached his exhibition at The Pace Gallery as someone who needed to be won over. Like other bodies of work he has made in recent years, The Present is rooted in Graham’s ongoing fascination with America. The Present was made on the streets of New York City, where Graham now lives. The pictures are shown as diptychs and triptychs allowing the action on the street to play itself out over two or three images made moments apart. This strategy works well in creating surprisingly absorbing micro-narratives, apparently unstaged (though I confess to wrestling with a degree of uncharitable scepticism in the case of the diptych in which a woman falls over). People come and go, a slight shift in the camera angle might subtly alter the mood of the scene or our perception those who populate it. Quite apart from the fascination of people watching which lies at the heart of the work’s success for me, the installation is interesting. With the largest works hung almost at floor level, the audience finds itself part of the scene. We become bystanders lost in the moment rather than remote observers watching the scene being replayed after the event. 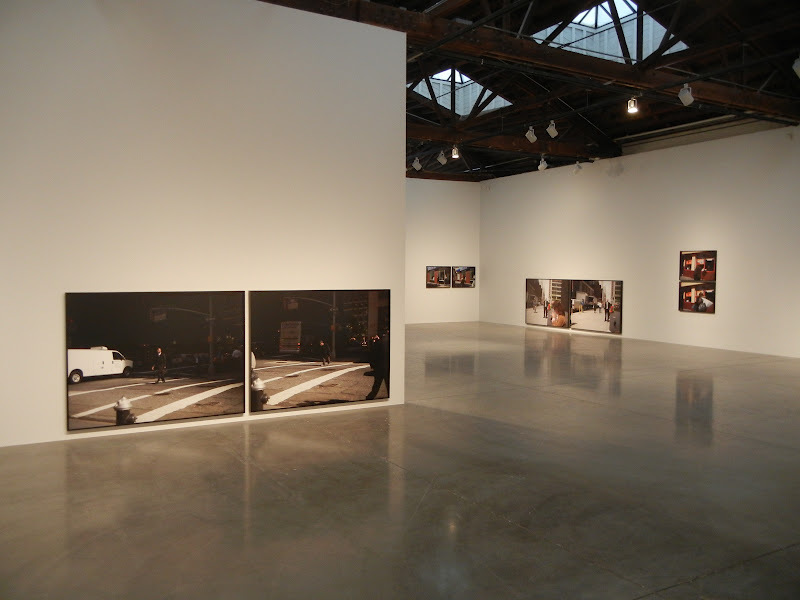 Paul Graham: The Present is at The Pace Gallery, 545 West 22nd Street until 24 March 2012. This entry was posted in Photography and tagged art, New York, Pace Gallery, Pace/MacGill, Paul Graham, photography, The Present by Ann Jones. Bookmark the permalink.